The Celebrity Standard CS24P guitar has the classic mid-depth Lyrachord cutaway body with quartersawn scalloped œX bracing. Ovation reviewed some of their earlier bracing patterns extensively to arrive at this remarkable new design, which borrows from the past and is voiced for the present with natural tone and optimal response and power. Together, body and top create the classic Ovation sound, resonating with full projection, remarkable note clarity and balance, and nuanced tonal complexity. The CS24P has an elegant abalone rosette, ivory white binding and beautiful nutmeg gloss finish. 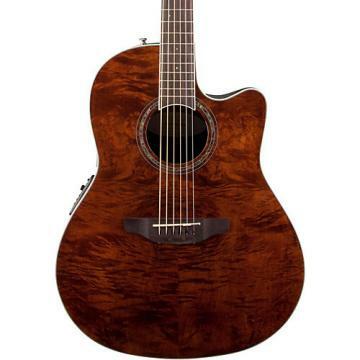 Other premium features include an effortlessly playable neck with a natural satin finish and rosewood-veneer headstock, 20-fret bound rosewood fretboard with abalone microdot inlays, and a rosewood bridge. For great live sound, the CS24P features an Ovation Slimline pickup and OP-4BT preamp system with 3-band EQ, volume/gain control, onboard tuner and low-battery light. 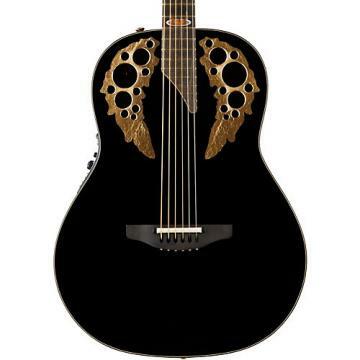 Enjoy Ovation design and sound on a budget. Order today. I am thoroughly disappointed in this guitar. The action is terrible and it goes out of tune frequently. I guess I had to spend more money for better quality. .Very sloppy tuners, does not stay in tune. I won't take it out because I do more tuning than playing. A well done instrument except for the tuners. really good looking. Sounds best finger style and plugged in. Not great flat picked. .Put on lighter gauge of strings which made the guitar even easier to play. Very pleased with the range of sound from high to low notes and chords. .This guitar for the conventional purpose at home does support creativity and tone control, however. The electric purpose can prove a bit of a problem in it lose of quality in sound control. Meaning the lack of saddle performance to any consumer in need of an on stage confidence reliability to execute whatever purpose at delivering music capability professionally or otherwise. I place no confidence upon the saddle's performances.